When I was researching Napoleon in America character James Many, I came across an amusing piece of satire in the March 9, 1852 edition of the Richmond, Virginia Daily Dispatch. It appeared on the same page as the description of Many’s Mardi Gras funeral, under the headline: “Aunt Hetty on Matrimony.” Though no byline was given, further digging revealed that the author was Sara Payson Willis, writing under the pen name of Fanny Fern. I had stumbled onto the work of the first female newspaper columnist in the United States, and one of the most highly paid authors in mid-19th century America. Before I talk about Sara, here’s the article that caught my attention – and there’s even a mention of Napoleon. 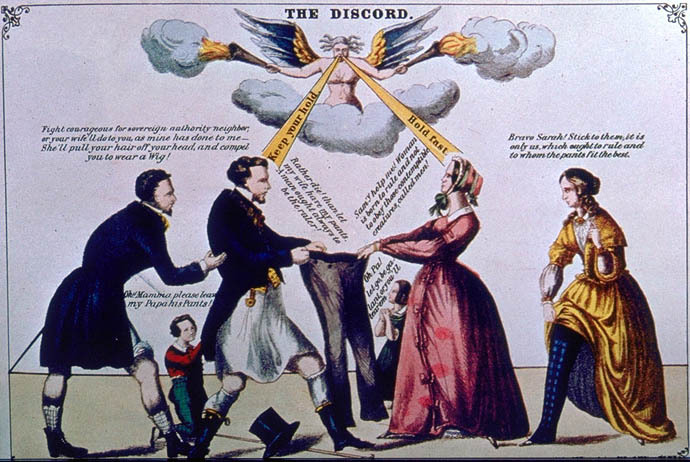 “The Discord,” 1865. A marriage dispute over who wears the pants. ‘Now, girls,’ said Aunt Hetty, ‘put down your embroidery and worsted work; do something sensible, and stop building air-castles, and talking of lovers and honey-moons. It makes me sick; it is perfectly antimonial. Love is a farce; matrimony is a humbug; husbands are domestic Napoleons, Neroes, Alexanders,—sighing for other hearts to conquer, after they are sure of yours. The honey-moon is as short-lived as a lucifer-match; after that you may wear your wedding-dress at breakfast, and your night-cap to meeting, and your husband wouldn’t know it. You may pick up your own pocket-handkerchief, help yourself to a chair, and split your gown across the back reaching over the table to get a piece of butter, while he is laying in his breakfast as if it was the last meal he should eat in this world. When he gets through he will aid your digestion,—while you are sipping your first cup of coffee,—by inquiring what you’ll have for dinner; whether the cold lamb was all ate yesterday; if the charcoal is all out, and what you gave for the last green tea you bought. Then he gets up from the table, lights his cigar with the last evenings paper, that you have not had a chance to read; gives two or three whiffs of smoke,—which are sure to give you a headache for the afternoon,—and, just as his coat-tail is vanishing through the door, apologizes for not doing ‘that errand’ for you yesterday,—thinks it doubtful if he can to-day,—‘so pressed with business.’ Hear of him at eleven o’clock, taking an ice-cream with some ladies at a confectioner’s, while you are at home new-lining his coat-sleeves. Children by the ears all day; can’t get out to take the air; feel as crazy as a fly in a drum. Husband comes home at night; nods a ‘How d’ye do, Fan?’ boxes Charley’s ears; stands little Fanny in the corner; sits down in the easiest chair in the warmest nook; puts his feet up over the grate, shutting out all the fire, while the baby’s little pug nose grows blue with the cold; reads the newspaper all to himself; solaces his inner man with a cup of tea, and, just as you are laboring under the hallucination that he will ask you to take a mouthful of fresh air with him, he puts on his dressing-gown and slippers, and begins to reckon up the family expenses; after which he lies down on the sofa, and you keep time with your needle, while he sleeps till nine o’clock. Next morning, ask him to leave you a ‘little money,’ he looks at you as if to be sure that you are in your right mind, draws a sigh long enough and strong enough to inflate a pair of bellows, and asks you ‘what you want with it, and if a half-a-dollar won’t do?’ Gracious king! as if those little shoes, and stockings, and petticoats could be had for half-a-dollar! O, girls! set your affections on cats, poodles, parrots or lap-dogs; but let matrimony alone. It’s the hardest way on earth of getting a living. You never know when your work is done. Think of carrying eight or nine children through the measles, chicken-pox, rash, mumps, and scarlet fever,—some of them twice over. It makes my head ache to think of it. O, you may scrimp and save, and twist and turn, and dig and delve, and economize and die; and your husband will marry again, and take what you have saved to dress his second wife with; and she’ll take your portrait for a fire-board! 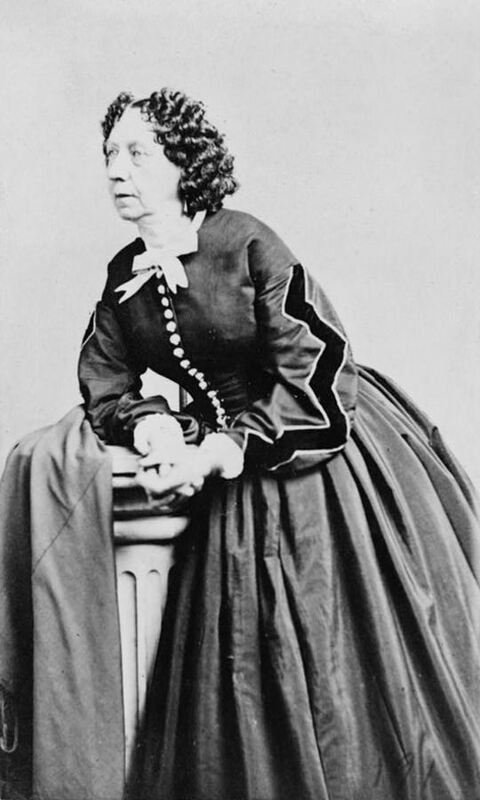 Sara Payson Willis was born on July 9, 1811 in Portland, Maine. Her father was newspaper owner and Calvinist Nathaniel Willis. As a girl, Sara proofread and wrote articles for Willis’s religious papers, the Boston Recorder and The Youth’s Companion. She married at the age of 26. After her husband died, leaving her with no money and two young daughters (her first child had died of meningitis), she remarried, at her father’s insistence. This proved to be a “terrible mistake.” (2) Her new husband was insanely jealous of her interest in anything outside the home, and Sara did not love him. Two years later, she left him. As this was the mid-19th century, when women were expected to put up with unpleasant marriages, this left her estranged from her family, a victim of slander, and without funds. After reluctantly relinquishing her elder daughter to her first husband’s parents, Sara turned to writing to support herself and her youngest child. In 1851, she succeeded in selling an article called “The Model Husband” (a satire about men’s shortcomings) to the Boston newspaper Olive Branch. Other articles followed, under the pseudonym of Fanny Fern, chosen in part because of Sara’s notoriety. Newspapers and periodicals across the United States and England began printing Fanny Fern’s humorous, irreverent articles. In 1853, she published her first book: Fern Leaves from Fanny’s Portfolio, a collection of articles, including “Aunt Hetty on Matrimony.” The book is a mix of humour, satire, sentimentality, melodrama and sermon, dealing for the most part with relations among men, women and children. At a time when women were expected to confine themselves to home and family, and cultivate virtues such as piety and submissiveness (the so-called cult of domesticity), Fanny’s sharp pen held refreshing appeal for a largely female audience. 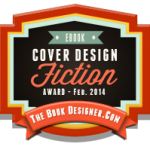 Fern Leaves from Fanny’s Portfolio became a bestseller, with over 70,000 copies sold in the first year. Three years after Sara’s first essay was published, she was hired to write one essay a week for the New York Ledger for the unprecedented sum of $100 per column. By 1855, “Fanny Fern” was the highest-paid columnist in the United States and a national celebrity. In 1856, Sara got married for a third time, to James Parton, who was 11 years her junior. They remained together until her death from cancer on October 10, 1872. Sara Payson Willis Parton is buried in Mount Auburn Cemetery in Cambridge, Mass. She wrote a number of books, the best known of which is the fictional autobiography Ruth Hall (1854). You can read Fern Leaves from Fanny’s Portfolio and Fanny Fern’s other works for free on the Internet Archive. Fanny Fern (Sara Payson Willis), Fern Leaves from Fanny’s Port-Folio (Auburn and Buffalo, 1853), pp. 377-379. Joyce W. Warren, Fanny Fern: An Independent Woman (New Brunswick, 1992), p. 83. Fern Leaves from Fanny’s Port-Folio, p. 89. Fanny Fern: An Independent Woman, p. 100. Fern Leaves from Fanny’s Port-Folio, p. 195. As with all of your entertaining, informative, articles, this one entertains and stimulates the mind in your evocative style. Thank you once more. Thanks, Bob. I’m glad you’re enjoying the articles. 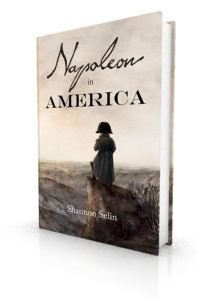 As for the sequel to Napoleon in America, I’m working on it now – hope to have it out by early 2017. I enjoyed reading this article on Marriage in the 19th Century. It could have been written for today’s world. Thanks, Beverly. It’s interesting how much of Fanny Fern’s writing still holds up well today. Some things don’t change as much as we think they do. Yes, she’s a great tonic. It’s no wonder she was popular, especially among women. Love is a farce; matrimony is a humbug; husbands are domestic Napoleons, Neroes, Alexanders,—sighing for other hearts to conquer, after they are sure of yours.